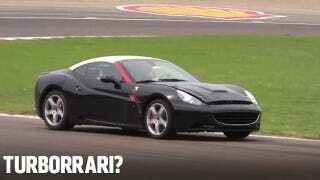 Why Did Ferrari Turbocharge This California? Considering Ferrari hasn't produced a turbocharged vehicle since the F40, we were rather surprised hear the familiar sound of a turbo coming from this California recently spotted on the manufacturer's private test track. Does this video footage from Fiorano mean Ferrari is welcoming in a turbo era? Probably, thought the smart money says this engine won't be in a car actually wearing the prancing horse. As Car and Driver revealed earlier this week, the next generation Maserati Quattroporte will feature a 520 hp turbocharged V8 built and designed by Ferrari when it debuts. Sometime after launch a 420 hp turbo V6 also built by Ferrari will be offered as an optional powerplant. With this in mind we're thinking the unexpected turbo sound coming from this California test mule is from one of the engines the company is currently developing for Maserati. However, if rumors about the Enzo replacement Ferrari F70 are to be believed, it will only be a matter of time before the sound of a 700-800 horsepower twin turbo V8 is also heard from Fiorano. Hat tip to Marchettino and Mikeado!